An unnamed stream runs a mile off the moor, following a line of deep-time seismic fracture in the Lands End granite, until it joins the Atlantic at Porthglaze Cove. On 5th April 2009, a localised storm came in out of nowhere straight off the Atlantic. In the space of two hours, the trickle of a stream swelled into a raging torrent. Near the cliff at Poniou, a trackway bridge collapsed; three young people lost their lives. 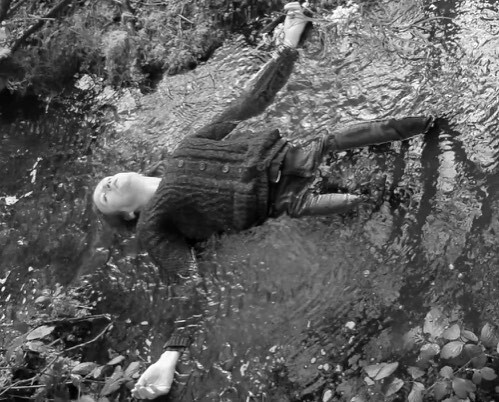 Ophelia, 2015. Grayscale screenshot from video. Fractured Earth is an art practice-based PhD project. I am looking to understand how an art practice might work thinking about landscape as always in being in eventful and sometimes violently eventful process. I have worked over the last thre years through a series of sited interactions and art processes, and with the eventful meetings of water and soil, rock and stream, land and sea. Thinking of the tragedy of the stream where I’m working, the sub-structure of cliff and granite with its origins deep within the mantle of the earth, challenges any tendency to conceive of the earth as static or the world as fixed or framed. How does an artist relate to conceptions of matter, sited within this play of distant and spectral others? How do these, often violent, events within the non-human world spill out in their affects – insisting that we understand land-water- scapes as being deeply political – and therefore insisting we conceive of artist practice such as this as inherently political in motivation and affect? In its eventfulness, art has the potential to confront anthropogenic dilemmas of human subjectivity by attending to ‘the radically unhinged experiences that occur when human conceptions of time beat up against earth processes, sometimes in a flash at other times over millennia’ (Nigel Clark, 2011, Inhuman Nature, p 201), and where despite human forcings the earth has the power to quake us to our boots, head-on.